So we've had our Roku 3 for a little over a week and I have to say, I love it. I am of course reserving complete judgement until enough time and usage has accumulated such that I can comfortably say that I am not experiencing any of the issues that many of the Amazon reviewers have sited. Background: while we always knew in the back of our minds, Nightingale and I recently realized that we can watch a lot of movies and television shows On-Demand through her Amazon Prime account. We configured it on the Wii in our basement and were enjoying catching up on many of the movies we missed when they were out in the theater. The drawbacks are 1) the Wii was designed as a gaming system first and a Streaming device as an afterthought and 2) the wireless in the basement is good but not great. We could watch a movie fine but it certainly wasn't HD or at least not 1080 HD and rewinding or pausing often interrupted the streaming such that you sometimes had to start the movie all over again. 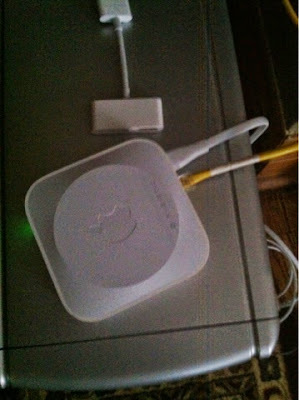 Hooked up to an Apple Express, Oh the Horror! Whenever it comes to a piece of new technology (iPad, phone, dishwasher, etc) my MO is to wait until the first couple of iterations for the bugs to get worked out, then I buy the best available that I can afford and I make it last as long as possible. So I was a little hesitant to get the Roku 3 because of the aforementioned issues. However, since I was able to buy it using points on Amazon, it was essentially free (Amazon even refunded me the $8 price difference when it dropped the price the other day though I did have to contact them to get the ball rolling). I figured if it worked out great, if it didn't, I plan to buy a Smart TV at some point in the future (probably once I finish paying for the Flood). I suspect that enough people complained about the Roku issues that Roku found a way to fix it through the automatic updates that the device downloads and also probably by quietly modifying the devices in the factory or lab or farm or wherever these puppies are built. The quality of the picture on the Roku as well as the menu interface is far superior to that of the Wii. Again I suspect it has to do with a more update device (our Wii is 4-5 years old?) 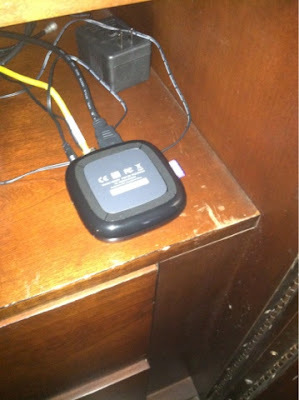 and we use it on the upstairs TV which is physically closer to the wireless router. Eventually I will run some hardwired connections throughout the house but for now, we can get Internet in every room we need it and also on the front porch, the back deck and even in the garage in case I want to watch a YouTube video on how to fix a lawn mower. Update: Last night we did experience our first glitch. While watching a show, our connectivity was apparently too unstable for streaming even though all our other i-devices worked fine. I believe this was the internet connection and not anything to do with the Roku per se. We were able to watch the rest of our show on the iPad and I will work on getting a stronger internet connection to the Roku. I'm thinking you'd be more pleased if the Roku was closer to your router. We've had ours (older model) about a year now and no memorable glitches. How do you like Amazon Prime compared to Netflix (what we use)? I have a no-TVs in the bedroom rule so the Roku is as close to the router as it can be at the moment. I never had a netflix account so I cannot really compare but i imagine they do pretty much the same thing. The Prime account is only costing $40 a year and Nightingale uses it for free shipping as well so from that aspect I'd say we are getting our moneys worth.